Welcome back to what looks to be another wild week of trading, as the Dow finished down another 125 points today as confidence continues to struggle with more negative outlook and bad earnings projections. Then to really rub it in, after close, Alcoa announced far greater losses than the market was expecting. They came in announcing a .28 per share loss, when the market was only expecting .10 per share. The same time period last year, they announced earnings of .36 per share. This can’t be a help to the already downtrodden market. However, I do think a green day is due, now that we’ve endured four straight days of downward trading. Also, the S&P didn’t close under 870 today, which was a pretty big momentum point. Plus, each day we get closer to Obama’s big day, may bring a bit more optimism. In any case, don’t expect the green to last long, if it even does at all. There has been some debate on this site and throughout the news of whether the financial markets and real estate values are going to start coming back soon. If you have been following this site, than you probably know where I stand. I just wanted to share some serious data that doesn’t just affect real estate, but the entire market. Real estate, specifically commercial, has a pretty strong correlation with the movement of the economy. If the data out there is correct, than we are far from over and have a lot more bumps to endure. Also, as I have said before, I specialize in the Real Estate industry, so I hear what’s happening first hand everyday and feel I have a pretty good read on what is going on in that market. Whatever the case, it reemphasizes my bull in SRS and even SKF or FAZ. 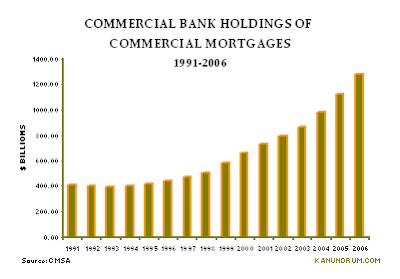 In 2006, it was estimated that commercial banks held $1.28 trillion in mortgages. In 1991, that same number is estimated to be $410 billion. As you can see, our banking systems have taken big strides into penetrating this market and adding to volume. How were they able to do that in such a short amount of time? 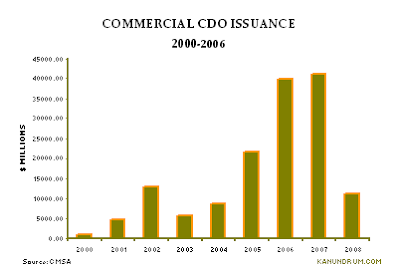 This is largely due to commercial mortgage backed securities (CMBS) and collateralized debt obligation (CDO). Through the help of these vehicles, commercial banks were able to unload a lot of these loans and recover a lot of equity by selling them as securities to consumers. As a result, they were able to put that extra equity into more issued loans. In turn, this has created a ridiculous amount of debt. 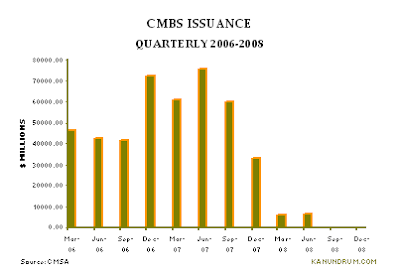 As you can see, there was a huge upswing in the issuing of these loans from about 2005 to 2007. On top of that, the valuing and underwriting of these loans got sloppy and many bought in to C-class valued loans, thinking they were A. As the economy began to slow and sales for retailers got worse, the default rate for tenants began to slowly climb. After a while, many of these start to not break even with their monthly debt service. If this continues, it will result in a delinquency of the loan and will end up going back to the bank. So how many of these delinquencies should we expect? Well, according to a report done by Deutsche Bank, they say the delinquency rate could get up to 30%. If so, they said that could result in $447 billion dollars in write offs. This could be disastrous. One of the main reasons many people believe we started this crisis was the failure in the residential sub-prime market. Well, if that’s the case, then we’re in for a rude awakening. The FDIC estimates that commercial banks own $2.1 trillion of the outstanding debt for residential real estate. They also estimate that commercial banks own $3.4 trillion of the commercial debt. With this huge increase in debt amount, coupled with the current state of our economy, we could be set up the biggest financial crisis we have seen. This doesn't even factor in the ones that don't default, but will be up for refinance, since many of the loans issued were 5-year, interest only loans. I know today Bush said financial markets were “thawing”, but the numbers sure do not read that way. I’ll believe it when I see it. As a result, that’s why I remain very bullish on my SRS (up over 12% today) and SKF or FAZ. With the huge hit to gold, I also picked up some more GDX today, considering I sold a lot of my options last week. Gold took a $35 hit today and has nowhere to go but up in my opinion. FXP has also enjoyed some serious gains lately. I have really enjoyed my portfolio this past week. I hope you enjoyed the Lending Club update. I will probably post the second half later this week. My first payments are scheduled for this week, so far so good. I got a lot of good feedback from people who are finding success with it as well. I wish you all the best in pursuing your financial future. Happy Trading and we’ll see you tomorrow. Have you ever considered buying UGL, the new proshares ultra etf for gold? Seems interesting but I am concerned becuase of the lack of history. Japan"s Nikkei is down --403 PTS right now. Prepare for it people cause tommarow its raining Blood in World Markets.I truely hate to say this but its a fact. All have to others that follow FF and stay with bears the fxp faz skf srs eev will safe others have hope for the bull so sorry you. what must say thank goodness in useing the bear etfs not hopeing like most investors. thanks FF your King the markets my friend!! What price are you holding on SRS? Hi there, need some help in understanding inverse ETFs here. Anon, I'm averaged in at SRS at about $62, as I have said before, I have high hopes for SRS. You can't track these etfs over a long amount of time. Daily, they do follow their indexes, but not always at a perfect 2x or inverse 2x. They are momentum buys. But this can work out for good too. Sometimes the stock will be up more than 2x. Buying at the bumps is the key. Thank you for your insights FF. I'm reading my first book of technical analysis. Being my first book about market, it looks like a quite powerful tool. I've heard that some don't believe about all these things, but hey, some do, so, why don't you sometimes add some graphs in your posts, or refer to them when you want to buy ? In the case of SRS, it looks like it could have been a great tool. I repeat, I'm a beginner, so correct me if I'm completely wrong about my thoughts. We can see that we add a down side (prices were always under the MA15) approximately from the beginning of December until the beginning of January (prices stop falling quietly, and MA15 stop falling, MA15 being horizontal). Three points I'd like to outline : not averaging down, resistance and volumes. The graph shows us that rather than averaging down, we could have waited and bought from the 11-12th of January (approx at $55). Of course, It doesn't mean that it will go up from now, but at least, we wouldn't have averaged down since the $160 level. I think it's a good think, and the more obvious. I think it's even more important when shorting because market had already fallen a lot. We can't count on this passed potential anymore, so, we must believe and hope that there are still some bad times to come. I know your position about this, but sometimes market is just crazy and is going up when fundamentals are down (look at the upswing from December, wtf ?). We can see there is a resistance at approx. $62. This one has been broken the 12th. It could be a good signal to buy too. More, volumes were a bit more higher this day. Volumes are not impressive, but bigger than those from the beginning of October until the end of December. It could be a good signal too, but I'm not sure for this point. It's a MA10 on the graph but there are no big differences. Sorry if my English is not perfect, but it's not my mother language. Hi.. What areh your thoughts on the following article? It says that leveraged ETFs are only for day trading and should not be used otherwise. Leveraged ETFs' numbers don't always add up. I would have told the writer he would have missed out on 30% extra gains if he sold FXP a few days ago on it's first bump. People wrote a lot of negative articles when the bull was back the last couple of months, they were upset, because they bought on the wrong bump. The fact is, these indexes historically track their index. Sure, they lose value after quite a while, but not to the degree, some of these bitter writers talk about. Thats just my opinion. I have made some very good money on these funds, and I held them for more than a few weeks. As far as all of those wall street banksters go I say lets exchange those three piece suits and briefcases for a good pick a shovel a bucket and some pinstripes. Though the customer service rep had set up a time with me and someone to meet in the store, the day I went no one expected me. However, I was promptly greeted by a sales associate, and right away he asked how he could help.